Complementary feeding is the process of gradually introducing other foods and liquids along with breast milk once breast milk alone is no longer sufficient to meet the nutritional requirements of infants. When to start introducing solids is a question that dietitians get asked often. According to experts in the field, complementary feeding should start at 6 months. It is also recommended that breastfeeding continue until two years and beyond, as breast milk remains an important part of a child’s diet and continues to be beneficial. There are a number of methods to assess a child’s readiness to start complementary foods. If you think your child is ready, speak to your dietitian as they may be able to assist. remembering that feeding times are periods of learning and love – talk to children during feeding, with eye to eye contact. Children’s nutritional needs change depending on growth spurts, breastmilk intake and a number of other factors. Therefore, it is important to let your child lead the way. If they have had enough to eat, don’t force them. Always remember: if your child is hungry, they will eat. So don’t worry too much about the odd evenings when they don’t eat much. They will make up for it later/tomorrow. However, if you notice a reduction in intake or you are worried about your child’s food intake and growth, see your nearest dietitian for a nutritional assessment. Baby-led weaning is a concept most parents have heard of. It refers to putting chunks of food onto your baby’s tray and allowing them to feed themselves. In other words, it focuses on offering your baby solid finger foods instead of pureed food. Although this technique may seem practical, it’s important to remember that babies need to experience different textures and consistencies. That is why, we as dietitians recommend starting with pureed foods and slowly transitioning to solids. Parents are often told when to start complimentary foods but they are rarely told how to do it and what consistencies to offer. At 6 months, offer pureed / mashed food. Transitioning from pureed and mashed food to solid food is essential. Children need to be introduced to different textures for their development. So don’t skip the “lumpy food” stage by going directly from smooth consistencies to solid, hard foods. 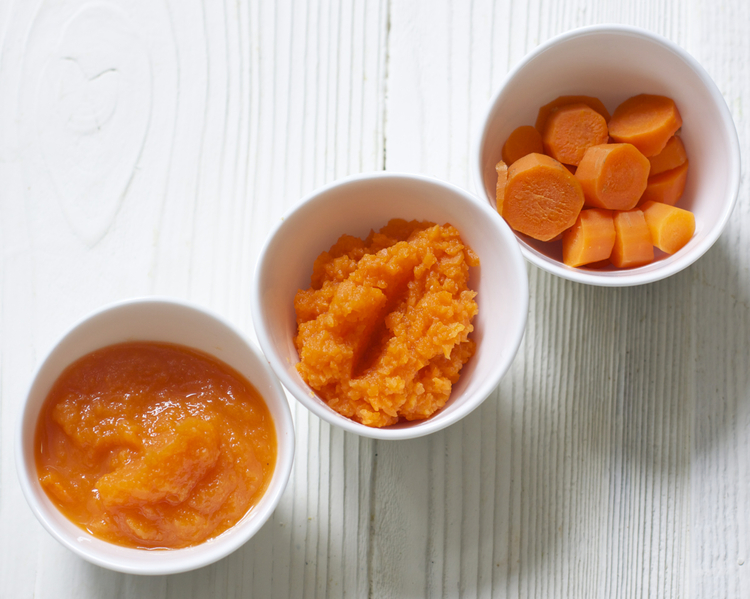 You may be wondering exactly how to transition your baby from puree to more solid food, without skipping the lumpy phase. You could start by blending the puree a little less every day and by adding chunkier bits of beans, chicken or vegetables. This way the puree will be thicker and more chunky, which is what you want. You could also offer more solid foods on the side. Put ½ a banana, some cooked pasta or bread soldiers on their tray next to their mashed vegetables. By 12 months: children should be eating with the rest of the family. By this age, you shouldn’t be making separate food for your baby. So make sure you are making wholesome, healthy meals that are good for you and your children. When introducing complementary foods for the first time it is important to start with one food, once per day. Not sure what to start with? Offer cereal (oats or other healthy cereals) or vegetable puree and as your baby gets older, include more variety. Remember: the more foods they are exposed to, the better. Start with one food at a time. 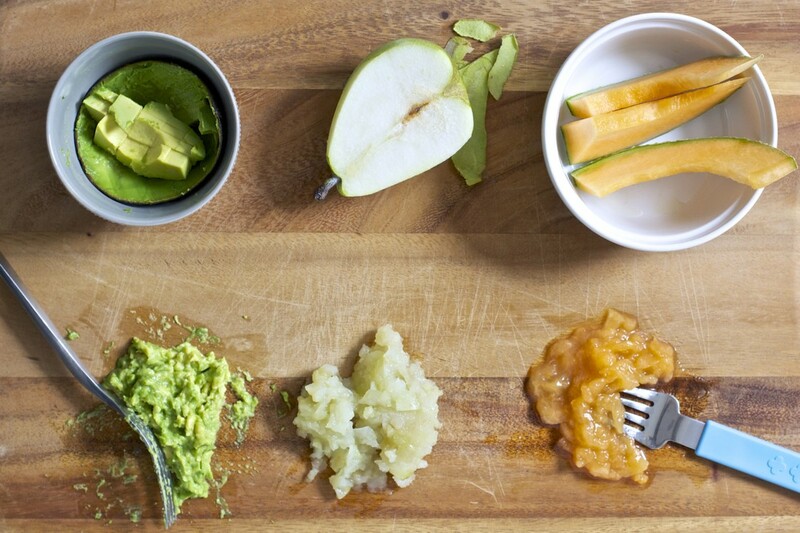 Once your baby is used to the taste, you can try different combinations: peach and banana, apple and pear, apricot and pear, banana and mango, blueberry and mango, blueberry and chickpea, carrot and apple, butternut and carrot, sweet potato and pumpkin, baby marrow and peas, broccoli and cauliflower, broccoli and potato, spinach and baby marrow, etc. Also try combinations with other food types (cereals/grains, meat, beans): oats and apple/banana, chicken and butternut, lentils and apple, butter beans and carrot, etc. You could also add chicken or bean puree to any of the above vegetable combinations. Limiting the intake of sugar and salt are important guidelines for adults. But what about children? We generally follow the same trend of thought for infants and young children: avoid excessive sugar and salt intake as it has been linked to obesity. High sugar and fatty, salty snacks should therefore be avoided in children. Always keep snacks healthy and nutritious. Many parents are not aware that flavoured yoghurts contain high amounts of added sugar. One small flavoured yoghurt can contain more than 2 teaspoons of sugar! Full cream plain yoghurt is the best way to go for young children in order to avoid the added sugar. As mentioned above, cereal is one of the foods recommended when introducing solids. It’s important to note that whatever cereal you choose should not be loaded with sugar. Rather opt for natural, high fibre cereals such as oats, tastee wheat or even oat bran. Breastmilk plays an important role in the diet of infants and young children. Therefore, breastfeeding is recommended for two years and beyond. But what about other liquids, such as cow’s milk, juice, tea and water? It is always important to remember that liquids fill children up and reduce their appetite, therefore you should avoid giving your child large amounts of liquid before a meal or snack. Before the age of one year, cow’s milk should not be given to children as their main milk drink, as the iron content is not sufficient. During this time, cow’s milk can however be added to foods such as cereals. Small children are often given tea or even coffee with or before their meals. This is not recommended as tea and coffee contain no added nutrients and tea may affect the absorption of iron in children. Children who are breastfed generally receive enough fluids during the day, so additional water is not necessary. Non-breastfed children may require some water, bearing in mind that it must be clean, safe water. Parents often think that fruit juice is a healthy alternative to gassy cold drinks. This is however not the case as many fruit juices on the market contain high amounts of sugar. Before the age of one year, juice should be limited. Thereafter, if you choose to give your child fruit juice, make sure it is diluted with water and don’t exceed more than one small glass a day. World Health Organization. Guiding principles for complementary feeding of the breastfed child; 2001. Geneva, World Health Organization.